One of the most iconic fishing lures of all time is the Jitterbug, invented by Fred Arbogast in 1938. Quickly becoming one of the most effective fishing lures of all time, it was manufactured in a number of sizes and came in over a hundred different colors. There are so many different Jitterbugs, in fact, that collectors and fishing historians alike have a hard time distinguishing between them. Now for the first time ever, noted outdoor writer and Jitterbug collector Sam Van Camp has produced the definitive history of this great lure. From the earliest wooden varieties to the plastic lip models of World War II to the seemingly endless varieties of plastic Jitterbugs, Van Camp takes the reader through the entirety of Jitterbug history. 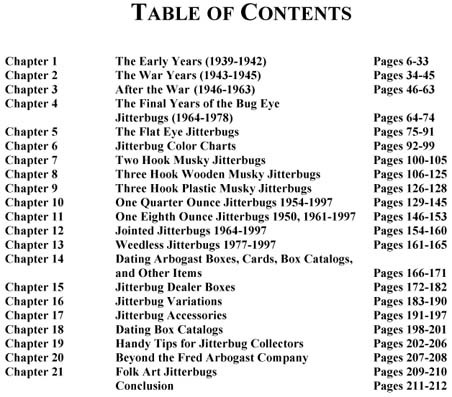 Includes detailed histories of early “Bug Eye” Jitterbugs, “Flat Eye” Jitterbugs, Musky Jitterbugs, 1/4 ounce Jitterbugs, 1/8 ounce Jitterbugs, Jointed Jitterbugs, Weedless Jitterbugs, Dealer Boxes, Box Catalogs, Advertisements, and much, much more. 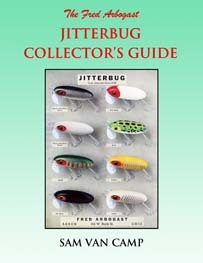 With over 800 color photos, The Fred Arbogast Jitterbug Collector's Guide will remain the definitive work on one of the best selling fishing lures of all time A must for any collector, historian, or dealer! 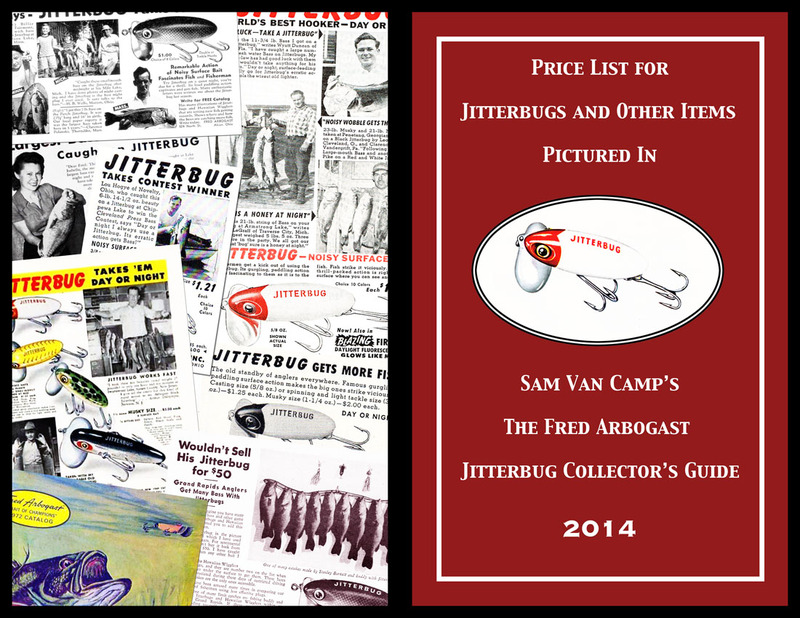 Includes a separately published 2014 Price List for Jitterbugs and Other Items Pictured in Sam Van Camp's Jitterbug Collector's Guide (20 page – 8.5" x 5.5") to be updated annually, designed to be used in conjunction with this book. See photo below. This price guide is also available separately; please email us for details.